Dermatosis is a condition wherein the skin dermis, hair, nail, etc has an irritation or an anomaly. Corticosteroids are usually used to treat inflammation, but it is observed that corticosteroids sometimes also helped alleviate dermatoses. Corticosteroids, besides their inflammation control action are useful in treating disorders that are caused by hyperactivity of the immune response. Corticosteroids’ has side effects, such as allergic responses. Corticosteroids are to be used as a topical ointment only in skin regions with inflammation. Globally, development of new technology, rise in the demand for corticosteroid-responsive dermatoses, and increasing government initiative are the prime growth drivers of global corticosteroid-responsive dermatoses market. 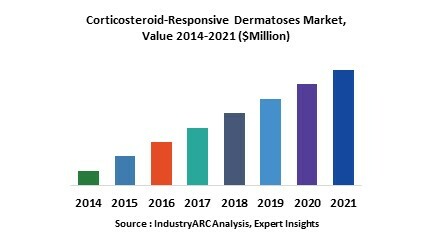 In addition, increase in adoption of corticosteroid-responsive dermatoses, and emerging economies such as China, India and others, will create new opportunities for global corticosteroid-responsive dermatoses market. However, higher cost of research and development, and harmful side effects are the key restraints for global corticosteroid-responsive dermatoses market. This report identifies the global corticosteroid-responsive dermatoses market size in for the year 2014-2016, and forecast of the same for year 2021. It also highlights the potential growth opportunities in the coming years, while also reviewing the market drivers, restraints, growth indicators, challenges, market dynamics, competitive landscape, and other key aspects with respect to global corticosteroid-responsive dermatoses market. Geographically North America dominated global corticosteroid-responsive dermatoses market, and Asia Pacific is projected to have fastest growth, owing to rapidly increasing aging population, and modernizing healthcare infrastructure in this region. Among all the types, mineralocorticoids has the highest market share in global corticosteroid-responsive dermatoses market.